Referee: Stuart Attwell - only the second time we've had the dubious pleasure of this Warwickshire -based whistler this season. His first outing ended in a dozen bookings (five to United) in our 1-1 draw at Wolves last August, where we reflected that he "was completely out of his depth". This at least was an improvement on that, although his haste to blow meant that allowing a possible advantage to develop wasn't a facet of this game. Slightly fortunately, he also chose not to interpret scuffles involving both Nolan and Tiote as anything more than bookable offences. 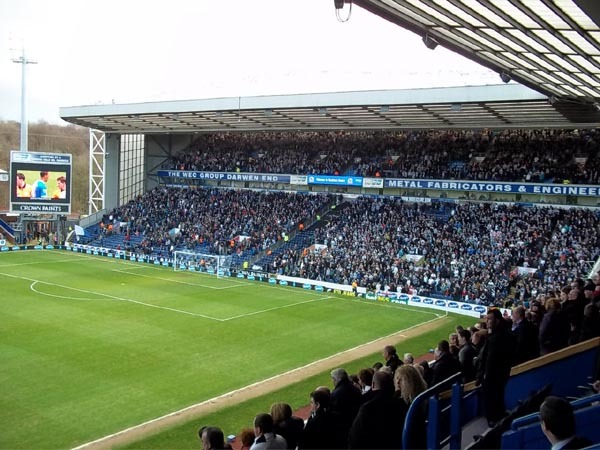 Attendance: 26,781 including 5,000 away fans, who occupied the whole of the Darwen Upper and part of the Lower (Rovers have sold reduced price season tickets this season in the other section of the Lower tier, which exclude certain games when the whole end is allocated to away fans). That's the highest of the season at Ewood Park and both Everton and Liverpool there. Local observers predict that the visit of Blackpool and Manchester United could well exceed that total. Amongst those spotted watching this game were Everton boss David Moyes, PFA chief Gordon Taylor and...Prince Albert of Monaco! A busload of Southend United fans were also in attendance, following the lunchtime postponement of their League Two game at nearby Accrington Stanley. "In the last third, the moment never arrived or we just made the wrong decision. "The mood of the team was obvious - they're all pulling for each other and there's a good feeling amongst the players. The league is so tight that we need to make sure we get a couple of wins in our next three games. If we do that, then I think we can play with a little bit more freedom to attack a top-eight position, which would be nice. "We’re tinged with disappointment because our performance was excellent. Sometimes against a side like Blackburn you can find yourself wanting in terms of size and strength, but we stood up to that part of the game really well. “And we bossed the other side of it, which was our movement and passing, so, as a manger, you have to be very pleased when you do that. The only disappointing factor was just around the last third, where the moment never arrived or we made the wrong decision. “On the sidelines, we felt like the home side because our fans were making the most noise and we were bossing the game, but it was like one of those home games where you end up getting a bit frustrated. With the amount of possession we had, perhaps we should have worked the goalkeeper a little bit harder. "I'm genuinely really pleased with that performance. We've had enough excitement for one week and a football game like that was a perfect tonic. I can't speak for Blackburn but I can speak for us and know we weren't right against Arsenal. We shipped in goals that were unusual for us. "If you look at our goals against column, it is very, very good especially since I arrived. We've really tightened up, so I was disappointed with that first half when we didn't function but in that second half we defended very very well. "We've taken that into today and we were at our best. There were a couple of occasions when Olsson skipped down the left but other than that, I can't remember the goalie doing a lot today. I've always played a team which is on the front foot, which encourages the full-backs to push on. Enrique today, wow, if anyone deserved to win a game it was him, he was magnificent. "I'm just very pleased with the reaction I've had from the staff and players in what I want to achieve. My style is perhaps a little bit different from Chris (Hughton). The way we controlled the game today was pleasing to see." "He's made it simple for us (Jose Enrique) - he is an important player for this team because a lot of it functions from him, a lot of our good stuff. Technically he was the best player on the pitch by some distance. "If we're going to win games, Shefki (Kuqi) will play a part because he's experienced. I've got young strikers and sometimes they make bad decisions because of their youthfulness. But Nile is pushing hard, he looks when he comes on like he's going to affect the game. He keeps reminding me that he's got more than cameo performances." "I think the games previously we have been getting into double figures when it comes to shots on goal but we certainly didn’t give their goalkeeper too much to work for. But having said that, when it is a poor game we met the first target of a clean sheet and we respect the point. "We had one chance that hit the post but we didn’t create anything else after that but at least it stops the defeats and we will take a point and hopefully we can move on and play a bit better in the next game and dominate a bit more. "I don’t think it was a pretty game to watch and the lads didn’t think it was a pretty game to play in. At least we have got something from it. In weeks gone past we were playing some good stuff and getting shots in on goal but that didn’t happen for us today. At least we have got something from it. "There is always something to take from any game. Look at the Wigan game where we don’t get any points but score three goals away from home. Look at the Tottenham game where we create so many chances but don’t get anything from it. The positive we take from Saturday is we did get a clean sheet, we didn’t play as well as we have been doing but showed a bit of grit and determination to get a point and play ugly and get something. "It was difficult to keep the ball because the surface was a bit bobbly and maybe that was a factor. Also I thought Newcastle pressed in the middle of the pitch, put pressure on the ball and it was hard getting four or five passes off. We tended to get one or two and then we were giving it away. Full credit to Newcastle they pushed and pressed and made it difficult for us to play. "We wanted to try and play off the front men but I felt the front men were coming towards the ball too much and we couldn’t get David Dunn in the game. We said at the half time maybe an opportunity when the full back got the ball for the striker furthest away to spin and get behind the centre halves and maybe to knock a few diagonal balls over the top to stretch it. That was difficult today though. "I think a reason for that performance could probably because we have lost a few on the bounce. What happens is there is an edginess about the team when we had possession. Maybe we have lost a little bit of confidence to keep hold of the ball, we have to keep believing in ourselves though and have faith in our ability. Shefki Kuqi became the 162nd player to appear in the Premier League for Newcastle. This was Newcastle's second goalless draw of the season and their 47th in the Premier League (21 at home, 26 away). Since August 1993 we've featured in 642 games, 173 which ended in draws (80 at home, 93 away). This may well mark a new low in our statistical output, but here's a season by season guide to those Newcastle games that finished nowts apiece. NUFC.com - going to the far end of a fart. Over a decade after he last watched the club play live, Prince Albert of Monaco doubtless reflected that nothing much changes where Newcastle United are concerned. The Sovereign of the principality was in attendance at both legs of United's UEFA Cup tie against Monaco in March 1997 and saw two games where the under-strength Magpies barely mustered a shot on target, never mind scored a goal (losing 0-1 and 0-3 to Jean Tigana's side). This stalemate did at least halt a worrying sequence of six successive defeats by Blackburn and saw the United defence register a first clean sheet in six games. However a fourth draw in five outings was the very least that Alan Pardew's side should have departed with, such was their dominance of the games against a Rovers side booed off after both 45 and 90 minutes. A bright opening saw both sides strike the woodwork, the less-than-fit Roque Santa Cruz hitting a post from barely six yards out, after nine minutes. Five minutes later it was United's turn, as Peter Lovenkrands lobbed Paul Robinson but clipped the top of the bar and rebounded beyond Leon Best, who collided with the advertising hoardings and needed treatment before resuming. Further goalmouth action was in short supply however and despite some enterprising play down the left flank from Jose Enrique, United couldn't apply the final touch - Lovenkrands narrowly failing to reach one stunning cross and Best mis-directing his first-time effort. Rovers introduced Jason Roberts and Morten Gamst Pedersen at the interval - both of whom had netted on Tyneside earlier in the season - but if anything, the home side were even less impressive when defending the end where the boisterous away support were contained. United would enjoy an overwhelming share of the possession but frequently wasted the ball from good positions - Jonas Gutierrez especially profligate. Fellow countryman Fabricio Coloccini came closest to breaking the deadlock with a powerful drive after 54 minutes, but shot straight at Robinson and saw the 'keeper tip the ball over his crossbar. Adding Nile Ranger to the attack failed to bring about a breakthrough, while former Rover Danny Simpson took a whack late on and was replaced at right back by James Perch. Shefki Kuqi came on for the last three minutes of added time against his old club but couldn't find the final touch that would have given him a dream debut. From feast to famine then after last week's incredible second half, but the point saw United inch forward to 32 and kept us in the top half - above Blackburn on goal difference but still just five points above the relegation zone. And while it's tempting to pour scorn on the four players utilised up front in the game and conclude that classier finishers would have helped secure three points, that only tells part of the story. For all the midfield solidity that we showed, an absence of creative quality was evident throughout - making the task of Best, Kuqi and the others that much harder. With the fitness problems that continue to beset both Ben Arfa and recent arrival Stephen Ireland (not to mention Dan Gosling), Pardew's decision to farm out Wayne Routledge remains a strange one. While not fit for purpose in our eyes, surely he fits the mould of a so-called impact substitute? It's not just in the forward line that our reluctant recruitment policy is having an effect - quite where we'd be if Jose Enrique got injured doesn't bear thinking about. Has anyone got Olivier Bernard's number?